The Bounceback Portfolio invests in the 10 worst performing FTSE 350 stocks of the previous year and holds them for the 3-month period, January-March. 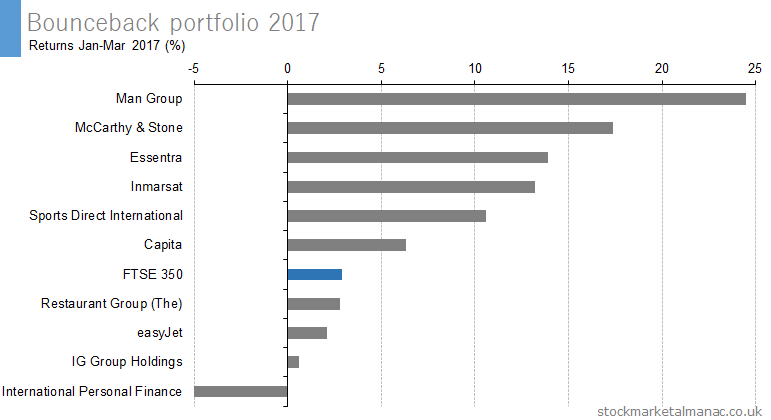 Let’s see how the Bounceback Portfolio fared in 2017. The following table lists the ten worst performing FTSE 350 stocks in 2016. These ten stocks form the 2017 Bounceback Portfolio. The final column in the table also gives the returns for each stock for the period Jan-Mar 2017. For example, Capita shares fell 56.0% in 2016, and then rose (bounced back) 6.3% in the first three months of 2017. 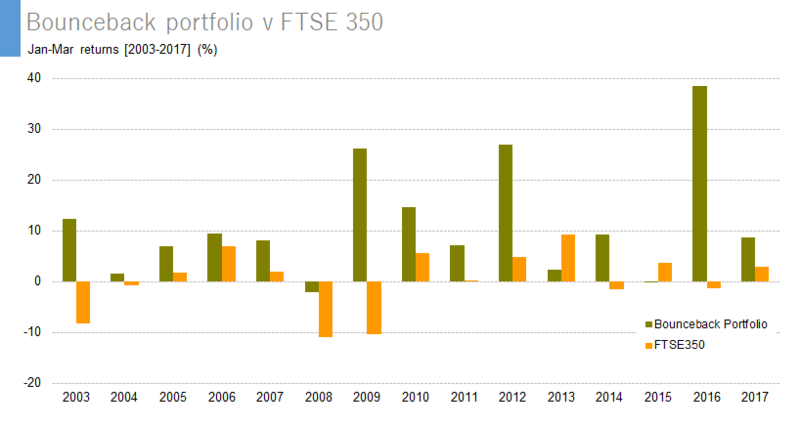 For reference, the performance of the FTSE 350 Index is also shown for the same periods. As can be seen, the majority of the bounceback stocks outperformed the Index in the first quarter of 2017. The performance of the 10 Bounceback Portfolio stocks for Jan-Mar 2017 is shown in the following chart. On average the Bounceback Portfolio stocks had a 3-month return of 8.6%, compared with a FTSE 350 Index return of 2.9% for the same period. So, an equally-weighted portfolio of the ten bounceback stocks would have outperformed the FTSE 350 Index by 5.7 percentage points over the target first three months of 2017. The Bounceback strategy has been tracked since 2003. 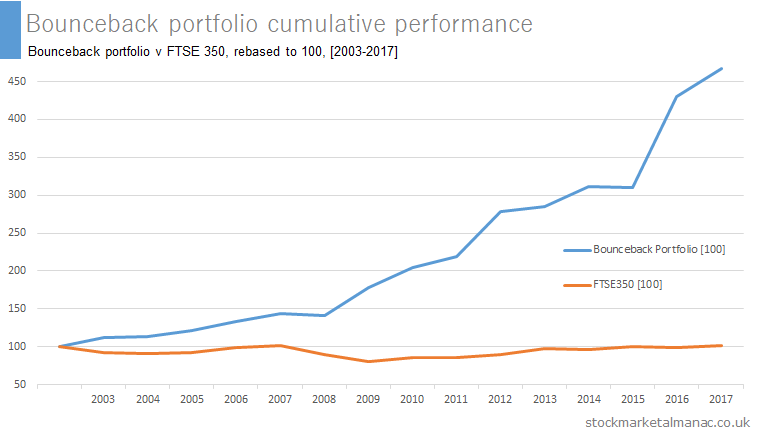 The following chart shows the comparative performance of the portfolio and the FTSE 350 Index for each year since 2003. Since 2003, the Bounceback Portfolio has under-performed the index only twice (in 2013 and 2015). The following chart shows the cumulative performance of the portfolio from 2003. The Bounceback Portfolio for 2016 recorded the best performance ever for the strategy: a 3-month return of 38.5%, compared with a FTSE 350 Index return of -1.4% for the same period. The following table lists the ten worst performing FTSE 350 stocks in 2016. These are the ten stocks that will comprise the 2017 Bounceback Portfolio. The final column gives the returns for the individual stocks for the first six days of the 2017. The portfolio as a whole has seen a return of 2.4% for the first six days of 2017, against a return of 1.9% for the FTSE 350 Index. The Bounceback Portfolio is meant to be held until the end of the March 2017, but it is good to see that it has started the year well so far. More articles on the Bounceback Portfolio. The 2013 edition of the Almanac looks at the historic monthly performance of the FTSE 350 sectors. Here we look at the Financial Services sector. The following chart plots the average out-performance of the FTSE 350 Financial Services sector over the FTSE 100 Index by month since 1999. For example, since 1999 on average the Financial Services sector has out-performed the FTSE 100 Index by 2.3 percentage points in January. 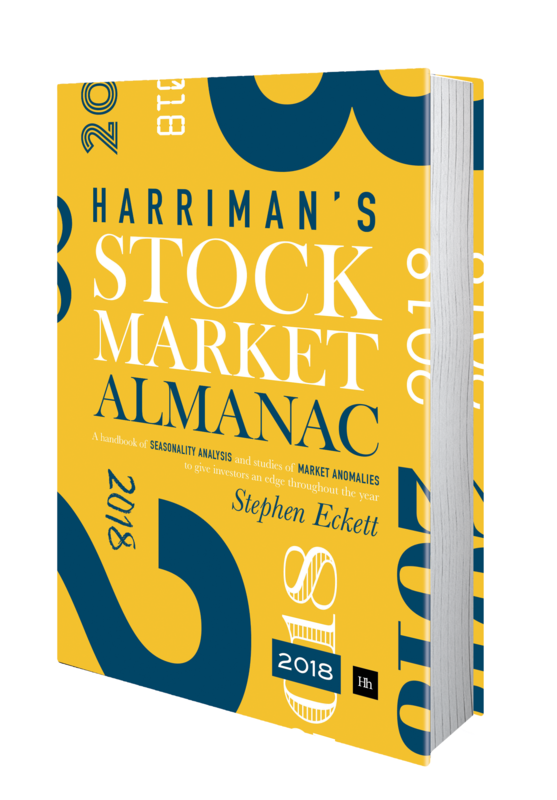 The strongest months are January and March – the sector has under-performed the market only four times in the past 13 years in January. The weakest month has been February – the sector has out-performed the market only five times in this month in the last 13 years.